As Thai Smile completes a transition from Thai Airways unit to subsidiary, the regional carrier assumes a mission to improve the group’s profitability rather than expand the group’s network. Thai Smile is adding seven A320s in 2014 for a total of 17 aircraft with virtually all of the capacity to be deployed on existing Thai Airways routes. The Thai Airways Group used Thai Smile to launch eight new international routes in 2013. But only one of these routes is still operating, with four cancelled and three temporarily suspended. Thai Smile has redeployed the capacity to take over a mix of domestic and international flights that had been operated by Thai Airways. More Thai Airways flights, primarily domestic but some international, will be handed over to Thai Smile in the coming months as Thai Airways’ mainline fleet shrinks. Thai Smile launched services in mid-2012 as a unit under Thai Airways, operating A320s on domestic and international routes under a full-service regional sub-brand model. Thai Smile has been working over the last several months on becoming a 100% subsidiary and securing an air operators’ certificate (AOC) from Thai authorities. Thai Airways’ acting president, Chokchai Panyayong, tells CAPA that Thai Smile plans to start operating under its own AOC in Apr-2014 and has been assigned the two-letter IATA designator code “WE”. The transition will not result in any changes to Thai Smile’s product or network strategy. Thai Smile will continue to work hand in hand with Thai Airways in coordinating networks and schedules, using the model used by Singapore Airlines with SilkAir and by Cathay Pacific with Dragonair. SilkAir and Dragonair are both regional full-service subsidiaries. From a network perspective, the Thai Airways Group will continue to consider Thai Airways and Thai Smile as one carrier. But the group decided Thai Smile should become a separate company because its product and brand while full-service is slightly different than Thai Airways mainline. By having Thai Smile operate under its own code there will be less passenger confusion. The transition is most significant from an alliance perspective. As it has been operating under the TG code, Thai Smile flights have been counted under Star Alliance and automatically were covered under all of Thai Airways’ bilateral and interline partnerships. This provided a seamless transfer experience for Star Alliance passengers although from an on-board product standpoint there has been some confusion as Thai Smile does not provide the same level of services as Thai Airways, particularly in the premium cabin. Thai Smile will still be part of the Thai Airways frequent flier programme, Royal Orchid Plus, but members of other Star frequent flier programmes will no longer be able accrue or redeem on Thai Smile flights. SIA has similarly elected to keep SilkAir out of Star but Dragonair is part of oneworld. Thai Airways is not concerned about losing connectivity with other Star Alliance members on regional routes as Thai Smile flights are removed from the Star network. Mr Chokchai says Thai Airways will focus on connections while Thai Smile is positioned mainly as a point-to-point carrier. He says only 10% of Thai Smile’s traffic consists of transit passengers. But some Thai Airways routes will be taken over entirely by Thai Smile, leaving passengers without a Star Alliance option. While Thai Smile will continue to operate alongside Thai Airways on some international routes such as Bangkok-Delhi, it has already taken over all Thai Airways frequencies to Colombo in Sri Lanka, Hyderabad in India and Phnom Penh in Cambodia. Thai Smile also plans to take over from Sep-2014 all Thai Airways flights to Vientiane in Laos. While from the Thai Airways perspective the transition from the TG to WE code in some regional markets is not an issue or concern for its passengers, there will be an impact on the Star Alliance given that Thai Airways is the only Star carrier in some of the impacted markets. For example Thai Airways is currently the only Star member serving Vientiane and Mandalay (the latter was launched as a Thai Smile route but is now part of the Star network as Thai Smile has been operating under the TG code). Thai Airways is one of only two Star members serving Phnom Penh or Hyderabad. Star Alliance will also be losing connectivity to several domestic markets in Thailand. While Thai Airways plans to continue operating to Thailand’s main tourist destinations, Thai Smile has already entirely taken over four domestic routes – Bangkok to Ubon Ratchathani, Udon Thani, Surat Thani and Hat Yai. As Thai Smile transitions to its own AOC, these four destinations will be removed from the Star network. Hat Yai is the latest and by far the largest domestic route to be taken over by Thai Smile. Hat Yai, located in southern Thailand, is the fourth largest city in the country and the largest outside Thailand’s central region. There are currently about 56,000 weekly return seats between Bangkok and Hat Yai, making it the third largest domestic market after Bangkok-Phuket and Bangkok-Chiang Mai. Thai Smile initially took over in Nov-2013 some of Thai Airways frequencies between Bangkok and Hat Yai. The remaining flights were handed over to Thai Smile on 30-Mar-2014. Thai Smile at the same time has added frequencies to ensure no significant change in total capacity. The withdrawal from Hat Yai leaves Thai Airways with only six domestic routes – Bangkok to Chiang Mai, Chiang Rai, Khon Kaen, Krabi, Phuket and Samui. Schedules from the Thai Airways booking engine shows Thai Smile will take over the Bangkok-Chiang Rai route from Aug-2014. Thai Airways currently operates three daily flights to Chiang Rai. Thai Smile, which briefly served Chiang Rai in early 2014, currently does not operate any flights to Chiang Rai but will take over one of the three Thai Airways frequencies in Jul-2014 followed by the other two in Aug-2014. Given its small size, Khon Kaen is also likely to switch over to Thai Smile at some point. Thai Smile currently operates three daily flights to Khon Kaen while Thai Airways operates two daily frequencies. Bangkok-Chiang Rai is now the sixth largest domestic market in Thailand while Bangkok Khon Kaen is the 11th largest, according to current seat capacity data from CAPA and OAG. Bangkok-Krabi is the fourth largest market, just behind Bangkok-Hat Yai, but is more important for connecting passengers as Krabi is a popular destination for international tourists. Samui, which is the seventh largest domestic market from Bangkok, is also a popular international tourist destination. Thai Airways’ current fleet plan envisions keeping two 737-400s until 2017 to enable the carrier to maintain its Bangkok-Samui service. Thai Smile is not an option for Samui because the Samui airport currently cannot be accessed by A320s. Thai Airways currently operates five 737-400s but plans to phase out three of the aircraft during 2014, leaving it just with the two aircraft dedicated to the Samui route. Thai Airways also plans to phase out its five remaining A300-600s in 2014. The phase out of the two types (barring the two 737-400s which will be used exclusively for Samui) is partly driving the transition of several routes to Thai Smile. The 737-400 and A300-600 are currently the smallest aircraft type in the Thai Airways fleet. Upon deciding in 2011 to establish Thai Smile, Thai Airways envisioned transitioning to an all-widebody fleet, following the model of Singapore Airlines and Cathay Pacific. Most of the routes Thai Airways has operated with the 737s and A300s have been unprofitable in recent years (Samui is an exception). While Thai Smile has evolved into a full-service carrier (initially there was consideration of following an LCC model) it has a much lower cost structure than its parent. Mr Chokchai says Thai Smile unit costs are 30% lower than Thai Airways. With Thai Airways mainly planning to use Thai Smile in 2014 to take over Thai Airways routes, the group is confident the Thai Smile expansion will help boost its profitability. Thai Airways incurred a net loss of THB12.047 billion (USD393 million) in 2013 and is aiming to be back in the black in 2014 despite an expected loss in 1Q2014 due to the political unrest in Bangkok. Thai Smile will report a separate profit and loss figure within the Thai Airways Group results starting in 2Q2014. Mr Chokchai, who will also sit on the Thai Smile board, expects Thai Smile to be profitable in 2014 given its success so far in turning around what had been unprofitable routes for Thai Airways. Mr Chokchai says the focus at Thai Smile will continue to be on expanding in the domestic market. About 80% of Thai Smile’s seat capacity is currently allocated to the domestic market. In the first two months of 2013, 64% of Thai Smile’s RPKs were flown in the domestic market. Thai Smile has had success domestically, making profits on routes which had been loss-making for Thai Airways. Thai Smile’s average domestic load factor in 2013 was 76%. Thai Airways also had an average domestic load factor of 76% in 2013 but the lower cost structure of Thai Smile allows for a lower break-even load factor. Given Thai Smile’s success at improving profitability on existing routes and the current challenging economic environment in Thailand it is logical for the Thai Airways Group to focus Thai Smile on existing routes. Initially the group envisioned using Thai Smile equally as a vehicle for taking over existing routes and launching new regional international routes which were previously not viable under the mainline brand. But Thai Smile’s initial success on new international routes has been at best mixed. Thai Smile has so far launched nine international routes which were previously not served by Thai Airways. One of these launches occurred in 2012 while the other eight took place in 2013. The carrier’s very first route, Bangkok-Macau, has been successful and continues to operate with two daily frequencies. But of the eight international routes launched in 2013 that were new rather than handovers from Thai Airways, seven have now been cut. Three India routes were particularly short-lived. Phuket to Delhi and Mumbai were launched in early Apr-2013 and cut in 3Q2013. Bangkok to Ahmedabad was launched at the end of Mar-2013 and was cut in Nov-2013. Thai Smile also launched Phuket-Kuala Lumpur in early Apr-2013 but dropped the route in mid-2013. The carrier has no plans for resuming international services at Phuket (it is now focusing entirely on Bangkok) or on Bangkok-Ahmedabad. The other three cut routes – Bangkok to Changsha (China), Luang Prabang (Laos) and Mandalay (Myanmar) – have been suspended only seasonally. Mr Chokchai says the expectation is for all three services to resume for the North Hemisphere winter season. Mandalay was launched at thee of Mar-2013 and operated through the summer season last year while Changsha and Luang Prabang were launched in 4Q2013. Thai Smile also launched Chongqing in China in 4Q2013 as part of an expansion made possible by the delivery of four A320s. The carrier added another two A320s in early 2014, marking a period of dramatic expansion as the fleet doubled in size from six to 12 aircraft in just five months. Unlike the three India routes, Changsha, Luang Prabang and Mandalay have been relatively successful but under the current market conditions it does not make sense to operate them during periods of low demand. Mr Chokchai says the Chongqing service will continue through the current summer season as Chongqing is a larger market while Changsha, Luang Prabang and Mandalay are smaller niche routes. Thai Smile’s international load factor has consistently been lower than its domestic load factor since 2Q2013, when it began pursuing international expansion beyond its initial Bangkok-Macau route. From Jul-2012 to Mar-2013, when Macau was its only international destination, the average Thai Smile international load factor was generally above 80%. 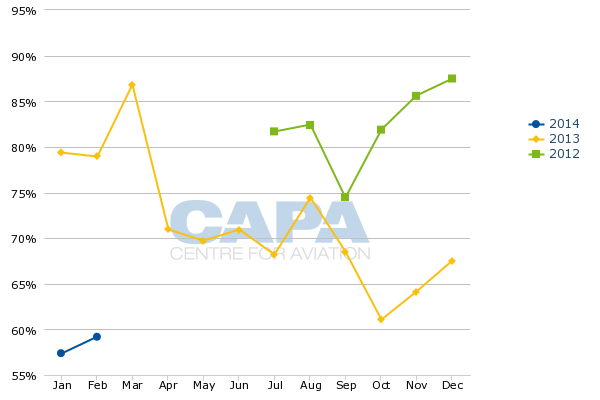 Since more international routes were added the average load factor has not exceed 75% for any single month. 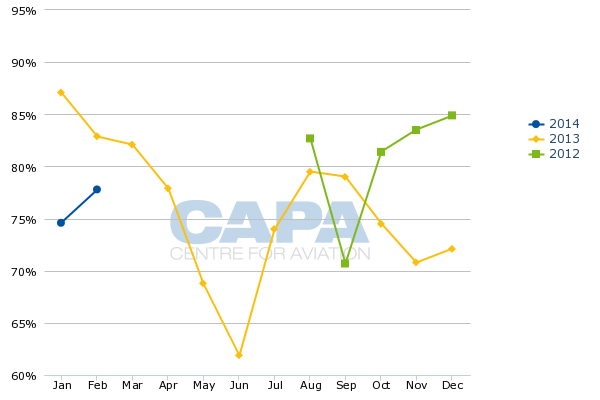 Thai Smile’s average international load factor was 70% in 2013, slipping to only 58% in the first two months of 2014. But Mr Chokchai says Thai Smile’s break-even load factor on most international routes is only about 50%. As the carrier has focused in the international market on niche routes which command a premium yield, it does not need high load factors. The three routes suspended for the summer were examples of niche routes with good yields but demand is currently not sufficient to even cover the low break-even load factor. Thai Airways plans to eventually again use Thai Smile to expand the group’s network. But for now market conditions do not warrant investing in new international routes. In the international market Thai Smile will instead be used for now to take over unprofitable Thai Airways routes and, in some cases, supplement Thai Airways. Mr Chokchai says the Bangkok-Colombo route, which Thai Smile took over in Aug-2013 and has since increased to daily, has been particularly successful. Also in South Asia, Thai Smile took over all Thai Airways flights to Hyderabad in Jan-2014 and more recently began operating five weekly flights on the Bangkok-Delhi route alongside seven weekly 747-400 frequencies from Thai Airways. Thai Smile plans to eventually again look at new destinations throughout Asia, with more secondary destinations in mainland China particularly attractive in the medium to long term. But with inbound demand from China now impacted by the political unrest this is not the time to launch new routes. There could be opportunities in 2015 to launch new routes. Thai Smile now plans to take the last three of the 20 A320s the group has committed to acquiring in 2015. Thai Smile currently operates 12 A320s, two of which were delivered in 1Q2014. Five A320s are slated to be delivered over the remaining three quarters of 2014, giving the carrier a fleet of 17 A320s by the end of 2014. The next A320 delivery is slated for May-2014, followed by one more in Jun-2014, one in Sep-2014 and two in Nov-2014, according to the Thai Airways Group fleet plan. The five aircraft being added over the next eight months will be used to take over Thai Airways flights as Thai Airways removes 737s and A300s from service. Overall Thai Airways plans to shrink its mainline fleet by six aircraft this year from 90 at the end of 2013 to 84 at the end of 2014 (with seven deliveries and 13 retirements). As the Thai Smile fleet grows by seven aircraft from 10 to 17, the reduction in mainline capacity will be offset by gains at Thai Smile. Mr Chokchai says the group is now looking at additional aircraft for Thai Smile for 2016 and beyond. Thai Smile is expected to stick with the A320 and at some point place an order for the new generation A320neos. But Thai Airways needs to wait for a return of political stability before moving on any new aircraft acquisitions as it is impossible in the current environment to secure the required government approval. While Thai Airways is now going through a challenging period, its ability to transfer routes to Thai Smile provides a silver lining to an otherwise relatively bleak outlook. Thai Smile has adjusted its network and strategy several times since its establishment. The carrier will continue to evolve over the next few years. But as it begins a new chapter with its own AOC Thai Smile is content on focusing on helping out its parent by taking over unprofitable routes. 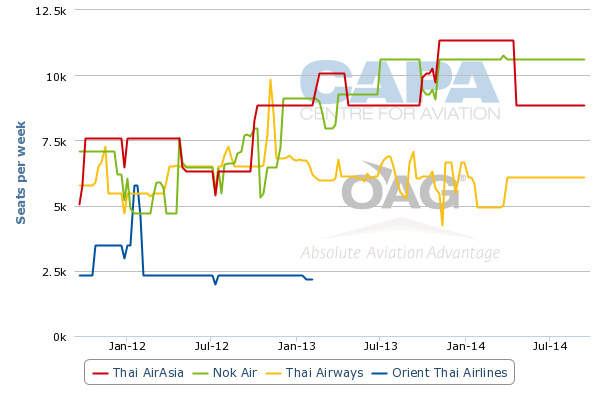 This is the second in a series of analysis reports looking at the outlook of Thai carriers. In the first report, CAPA analysed the outlook and position of two long-haul low-cost start-ups, Thai AirAsia and NokScoot.